Below is a quick image I took with my iphone of some prints that were framed incorporating the digital matts. 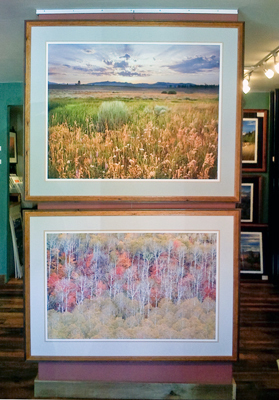 There is no glass in front of these, I just sprayed them with Premier Art Print Shield to protect them from fading. They would not be protected from impact to the image, but if left alone they should last a lifetime indoors. I think that glare-free plexi could be used to further protect them, but this creates further framing complexity that may not be necessary if the images are hung in a safe location.